I’ve been following the blogs of two other people here on WordPress, namely Evelina (alias The Vegan Cook, from New York) and Samantha (from London) who is learning to kvetch, and following their gradual conversion to Judaism. They talk about their past, their dreams, their difficulties and their ongoing fascination and acceptance of Judaism and their wish to be seen as Jews and to be accepted by the Jewish community. So I think I should talk a little about my religion. Assuming you’ve read many of my previous entries, you’ll have gathered that I’m a Christian. How did I come to be a Christian? You could say I was born into it, even though both my parents were atheists. My father remained atheist right up until his death and my mother is still resolutely atheist. They brought me to Belfast when I was fourteen months old in October 1972. Now it must have flown in the face of common sense to bring a baby into a war zone, which is pretty much what Belfast was at the time, but that’s for another post. It was my grandmother, my mother’s mother, who started me on the path to Christ on that autumn day of 1972 (even though I’ve no memory of it). It was clear to her that my parents had no intention of getting me baptised, so she took matters into her own hands by holding me over the kitchen sink (when my parents weren’t looking) and performing a baptism there. So, maybe the Catholic Church didn’t recognise me as a Christian but it’s very likely that God did! It was my Granny who got me into the habit of going to Mass every Sunday. And she had a few old prayer books and missals lying around her house, including one or two in Latin (which might explain why Latin was one of my strongest subjects in secondary school). And then there was my primary school, Holy Family, off the Limestone Road in Belfast, which I attended without interruption from 1976 to 1983. It was run on Catholic principles and which had a church right next to it. Of course I attended at least one weekday Mass with my class, and that’s in addition to the Mass I went to on Sundays with my Granny. But for some reason which I barely understood at the time, I was not allowed to go up and receive Holy Communion. What I was able to ascertain was that I had not been baptised like all the other boys and girls at my school. I was put out. I wanted to be part of that community and I couldn’t because I had not been baptised properly, or not at all. (Remember I was nine or ten at the time.) So by coaxing my parents and with no little persusasion from Granny, and after a good talk with the parish priest, one Father Henry Carlin, it was finally arranged. On Saturday 13th March 1982 at 12:00pm I was baptised. This period as a good, God-fearing, church-going Christian continued into my teenage years. But towards the middle to late 80’s my church-going became more and more erratic. Yes, ny school was consistent on giving me guidance through adolescence (some would call it brainwashing) but I was becoming complacent and not getting much out of my church attendance. I was just going through the motions. It didn’t help that my voice was breaking and I couldn’t trust myself to hold a tune during the hyms. Over the next few years, I stopped going to church altogether. I began reading up on other religions, namely Buddhism, Paganism and Judaism and wondered if I had it in me to abide by any of those religions. Not much happened during my years in London until 2009 when I found myself out of work. I decided to use my redundancy money to buy a bike and spend my time exploring. For the first month or so I was riding around the city and the suburbs, but soon I started cycling out to the Essex countryside and exploring all the little towns and villages beyond the fringes, places like Stondon Massey, Stapleford Abbots, Lambourne, places you’d omly find on an Ordnance Survey map. In addition to these places I discovered lots of little country churches (all Church of England, of course, but that didn’t matter to me. It still doesn’t). Ocasionally one would be open and I would spend a few minutes exploring it, relaxing in it, taking in the surroundings and reading bits and pieces from any prayer books that may have been around. This, in turn, led me to buying a Bible, the King James Version, and reading parts of it, and eventually reading whole chapters at a time. I was already a regular listener to UCB Radio and sometimes took part in their radio competitions. And ultimately, at the start of 2010, I found a Catholic church within easy reach of my place in Walthamstow (Our Lady & St George’s in Shernahll St.) and I started going to Mass there regularly. I carry on going to Mass every Sunday at St. Patrick’s here in Downpatrick. And whereas before I was really only going to Mass because I felt I had to, now my heart is in it. My mood today is the antithesis of my mood two months ago and therefore this post will be the antithesis of the ones of December 21st. I’m in elated spirits! We only have hazy sunshine at the moment but today is the warmest day we’ve had so far this year. 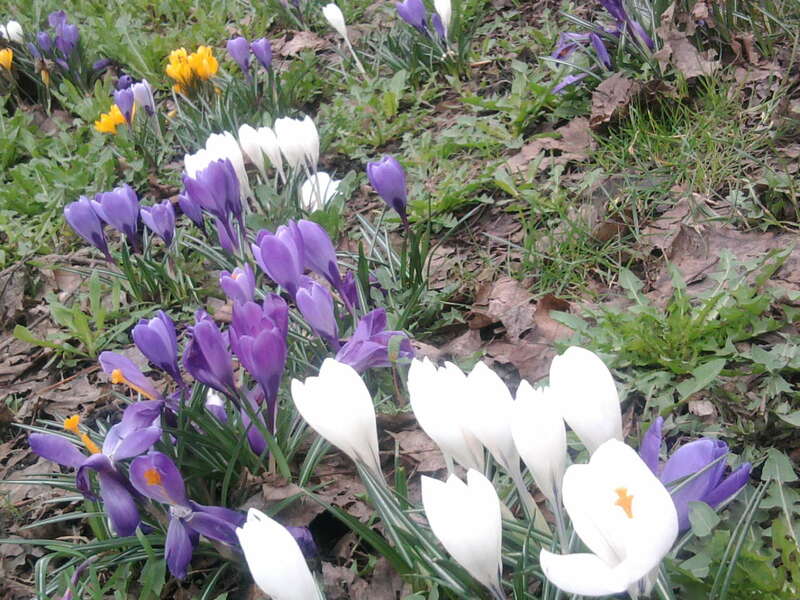 And as I was cycling from Enfield to Crews Hill I was delighted to see a riot of purple, yellow and white flowers – crocuses! Now you’ll understand why I’m in such a great mood. Especially after all the miserable weather we had during the past few days. There’s something else I haven’t done for months – I’m having tea al fresco at BoJo’s cafe at the garden centre at Crews Hill. The last time I had dinner here at South Mimms it was pouring out of the heavens. That was on August 10th. Today could hardly be more different. The English countryside on a bright, sunny day is guaranteed to fill my heart with joy. While everyone else is blundering about in the city, I’m out here enjoying every minute of sunshine God sends. There are many reasons to praise the Lord and this is just one of them! Some more evidence that our society is becoming estranged from Jesus: Marks & Spencer’s xmas slogan reads, "Christmas wouldn’t be Christmas without Marks & Spencer" Sorry, but that is bull! What’s Christmas if you forget about the event that started it off, in a stable in Bethlehem some 2000 years ago? Jesus Christ was born. That seemingly insignificant event changed the world forever. Just think about it, and all the trappings of xmas today look so shoddy.